Dame Pauline Neville-Jones, ex-head of the Joint Intelligence Committee, is to lead a Tory policy group on security. Conservative leader David Cameron said the new group would examine all areas of UK national security, including terrorism and Islamic fundamentalism. Its remit also includes social cohesion "including questions of community relations, immigration policy and their linkages with the UK's foreign policy". It is the fourth policy group unveiled since Mr Cameron became leader. Other policy groups include one looking at global poverty, advised by Bob Geldof, another on green issues with former minister John Gummer as chairman and environmentalist Zac Goldsmith as his deputy, and one on social justice, chaired by former Tory leader Iain Duncan Smith. 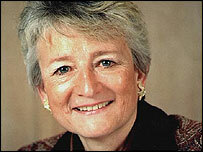 Dame Pauline Neville-Jones was Joint Intelligence Committee (JIC) chairman between 1993 and 1994, responsible for briefing ministers on security issues, and was subsequently political director of the Foreign Office. She later became a governor of the BBC from 1998 to 2004 - covering the time of the publication of the Hutton Report on the death of government weapons expert Dr David Kelly, which was critical of the corporation. Dame Pauline was in the diplomatic service for more than 30 years, including time as head of policy and planning staff in the foreign office. The new Tory policy group - which will view UK security from both a domestic and international perspective - has former cabinet minister Lord King of Bridgewater as its deputy chairman. Lord King served in the Margaret Thatcher and John Major governments for a total of 14 years. He is a former Secretary of State for Northern Ireland and Defence Secretary and was also the first chairman of the intelligence and security committee, a post he held for seven years, until 2001. Announcing the policy group, Mr Cameron said his party had has always stood for the "strong defence of our national security". He said the party needed "serious long-term thinking" to come up with policies that protect the UK's security while "protecting the values of our liberal society". "That is why we're bringing together experts on international relations, security, defence and community cohesion to look at these problems in a coherent and connected way," said Mr Cameron. The policy group's brief will also consider threats from "failed and failing states"; the proliferation of unconventional weapons and building community "cohesion in an increasingly diverse culture". Its remit also includes the structure of policing, defence policy and immigration issues including border controls. It will also examine the security services and administrative structures in Whitehall "to deal with the threat of terrorist attack".